I got off to a pretty bad start in my predictions, going 0-4 in the comedy acting categories. A win last year and having hosting duties this year didn’t help Jane Lynch, as she lost out to Julie Bowen of Modern Family for Outstanding Supporting Actress in a Comedy Series. I would have personally preferred her co-star, Sofia Vergara, but Bowen does fine work on Family, and the faults with Claire Dunphy lie more in the writing than the acting. Mr. Dunphy, Ty Burrell, then walked away with Outstanding Supporting Actor, making it clear that Modern Family would be a dominant force throughout the night. Emmy’s love for Modern Family was already pretty well known, though. What was more surprising were the wins (and, thus, losses) in the comedy lead acting categories. Steve Carell lost out on his final chance for an Emmy for playing Michael Scott, and the award instead went to repeat winner Jim Parsons for The Big Bang Theory. And capitalizing on her star turn in Bridesmaids this summer, and in the process squashing the streak of non-comedic Showtime actress wins, Melissa McCarthy won for Mike & Molly (even though the award should have, hands down, gone to Amy Poehler). Overall, the comedy awards — also including wins for writing and directing for Modern Family — were, if not completely predictable (obviously, since I predicted none correctly), unsurprising. The lead actor/actress were more disappointing, but nothing came out of left field. But then the drama categories mixed things up. Big time. Jason Katims won for Outstanding Drama Writing for penning the Friday Night Lights finale — a big upset, considering it was up against Mad Men‘s “The Suitcase,” which was generally agreed upon to be the best episode of television this past year. I love Mad Men, but this was an extremely welcome win for the criminally underwatched and underrecognized FNL. Margo Martindale and Peter Dinklage won Outstanding Supporting Actress and Actor, respectively, and while I predicted their wins, part of it was just wishful thinking, since the fields were quite strong in both categories. Julianna Margulies won for Outstanding Lead Actress for The Good Wife, earning the statue that most predicted was going to be hers last year. And then, in what most (including me) thought would come down to Jon Hamm and Steve Buscemi for Outstanding Lead Actor, Kyle Chandler — Coach Taylor himself — took home the gold for FNL, in a win so unexpected he didn’t even prepare a speech, thus inadvertently forgetting to thank both his on-screen wife Connie Britton and his real-life wife and kids (the audio had been cut by the time he remembered). Hamm gave a hell of a performance in “The Suitcase,” but I’m pretty sure the only thing that could have made me happier than Chandler winning is if Britton had gotten to accept her own award moments earlier. With two big upset wins for FNL, Outstanding Drama Series was actually a bit uncertain, right up until Mad Men was announced for the fourth year in a row. The Emmy logic doesn’t quite make sense to me (Mad Men wasn’t good enough to win any acting, writing, or directing awards, but was still the best overall series? ), but the ultimate winner was truly the best drama series of the year, even if it gets boring to have the same name called year after year. And although it was decidedly NOT the best comedy series of the year (that distinction goes to Parks and Recreation), Modern Family walked away with the top comedy award, in a win that was apparent from the time the first award was announced (if not even before the show). So after a rough start, I ended up 5-10 in major category predictions, which isn’t too shabby. And since I struggled most in the comedy categories, next year I’ll know: always err on the side of Modern Family. Did any wins particularly shock you? Any egregious snubs? 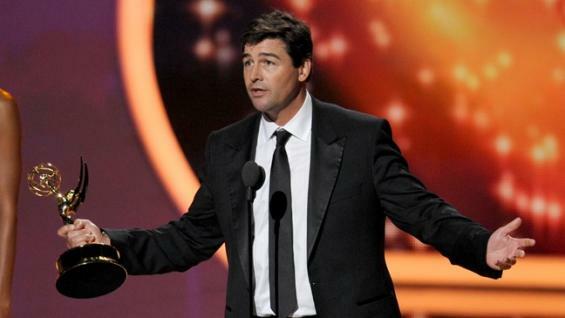 Were you as happy about Kyle Chandler’s win as I was? Share your thoughts in the comments section below! This entry was posted in Emmys and tagged Emmys, Jim Parsons, Julianna Margulies, Julie Bowen, Kyle Chandler, Mad Men, Margo Martindale, Melissa McCarthy, Modern Family, Peter Dinklage, Ty Burrell. Bookmark the permalink. I disagree with your assessment of Madmen. ‘Suitcase’ was a good episode (penned for the Emmys) … but the final season of Friday Night Lights, including ‘Always’ (the ep submitted for Katims, Chandler, and Britton) was a masterpiece. Chandler had more face time in the series finale that Britton. I would have submitted the Chandler-directed “Texas, Whatever” for her. Thanks for commenting! All in all, I can’t really argue with you on this one. “The Suitcase” was great, and featured amazing work from Hamm and Moss, and I think Mad Men, overall, had the best season. But Friday Night Lights capped off a wonderful 5-year run with a terrific final season, and definitely earned those Emmys. I thought the season started off a little shaky, especially with the Tami/Epyck storyline, but it certainly ended strong. I know that the way the Emmys work, a series is only judged by the couple of submission episodes, and writing, acting, etc. by the single submission, and under those circumstances, it was really a toss-up between a bunch of great nominees. Like I said, though, I was beyond thrilled for Chandler and Katims’ wins, and would have liked nothing more than for Britton to have won alongside them.